I purchased the Sydney Pro this afternoon but am unable to install it. I get this message: “The uploaded file exceeds the upload_max_filesize directive in php.in.” I notified my hosting provider and he increased from 20MB to 32MB but still getting the same error message. How big is this theme? What am I missing here. Please help! Which file did you upload? Was it sydney-pro-ii.zip? Yes, it is the Sydney Pro and yes it was the zip file. We were just following the upload instructions and it did indicate to upload the zip file. My hosting provider did increase from 20MB to 32MB but wondered how big this file actually is? Seems very large. I need a quick resolution to this issue. Can someone please help ASAP? Did you mean to say that the file is 3.1MB or 31MB? If it is only 3.1MB , why wouldn’t it have loaded if my hosting provider had 20MB? Why would we get an error message that the file was too large? Installing manually isn’t something I’m familiar with so I need help. Please tell me why the file is too large at 3.1 MB. Kharis or someone, can you help me with this installation? 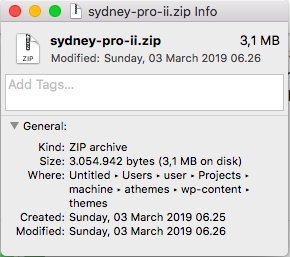 Was the Sydney Pro ii file only 3.1MB? If so, why am I getting an error that the file was too large? SOmeone please help. I am sorry for the long delay. I didn’t meant to – but I was sick at that time. Try re-download it again from your account, please. Apologies, hadn’t seen your last message. It was a problem with our hosting settings, we have installed the theme now.